Lemon Tofu and Beans is a one-pan meal that the entire family will enjoy. The tofu is baked to the perfect tenderness and lightly seasoned with fresh lemon juice. 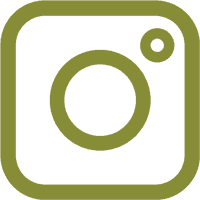 This post is sponsored by the EZ Tofu Press – All opinions are my own. We love tofu at this house! It is a great meat-free meal option and we are always working to create new recipes with tofu. We also have an abundance of beans in our garden. This year we have green beans, purple beans, and wax beans. 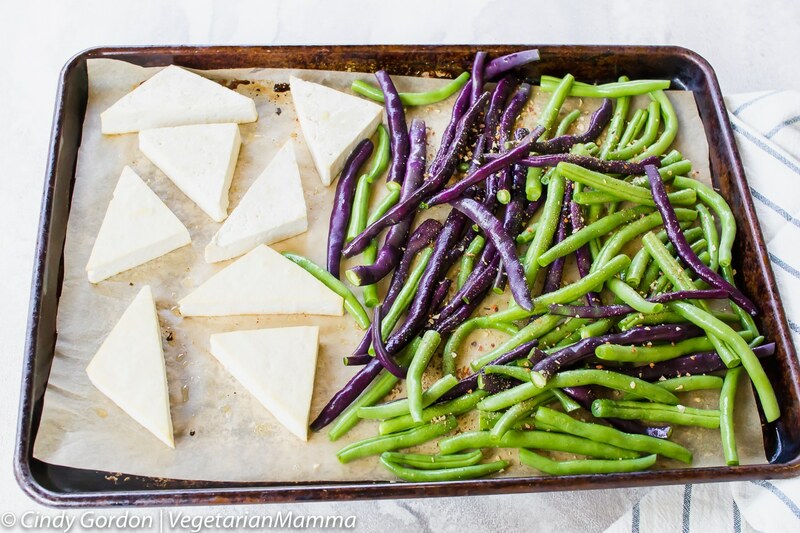 In this recipe, we featured some green and purple beans. First off, don’t be scared of using tofu in your cooking. We use it ALL the time in our home, and it’s amazing. So awesome in fact that my kids actually like it and prefer it. This recipe calls for veggies and honestly….I’m a sucker for all different types of vegetables. 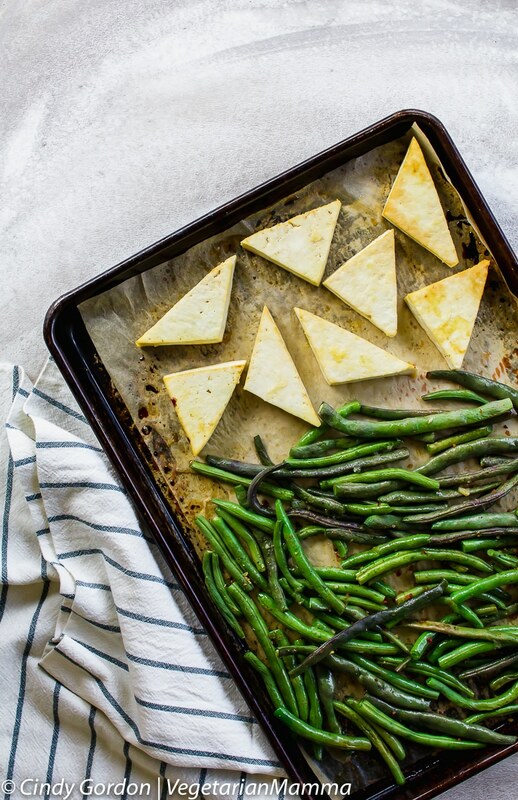 Obviously, I really love these green beans and tofu recipe. 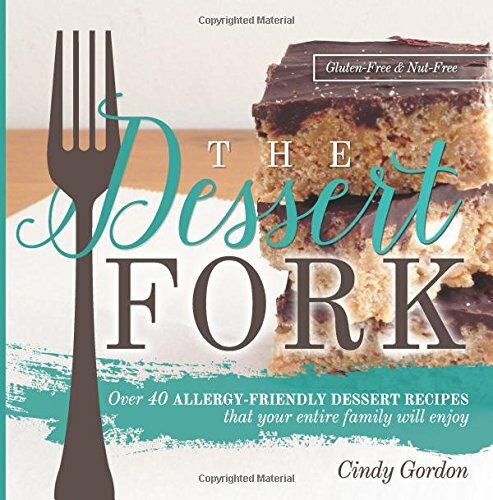 In fact, it’s actually one of my favorite summer recipes to make for the family! 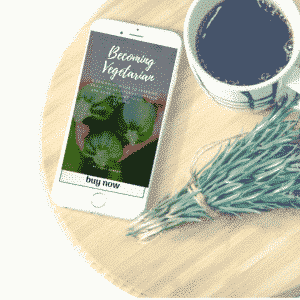 Wondering how to get your tofu just right? Don’t worry, here’s my little tip on how to make it perfect! If you’re going to be cooking with tofu, then you. need an EZ Tofu Press! Tofu holds water and you need to be able to get that water out so that it firms and cooks without being soggy! 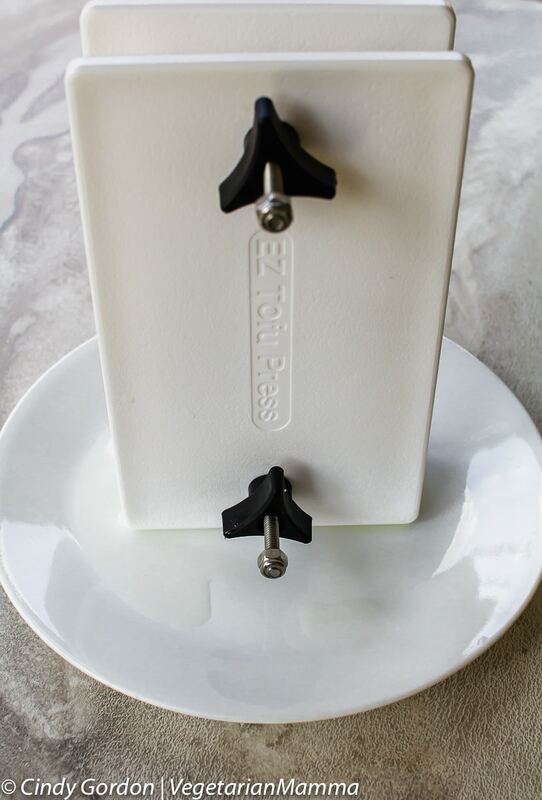 All you need is the EZ Tofu Press, and you’ll be well on your way to cooking and eating tofu in no time at all. Did you know that you can even have crispy tofu, marinated tofu or just plain tofu slices with ease to add to your recipes? 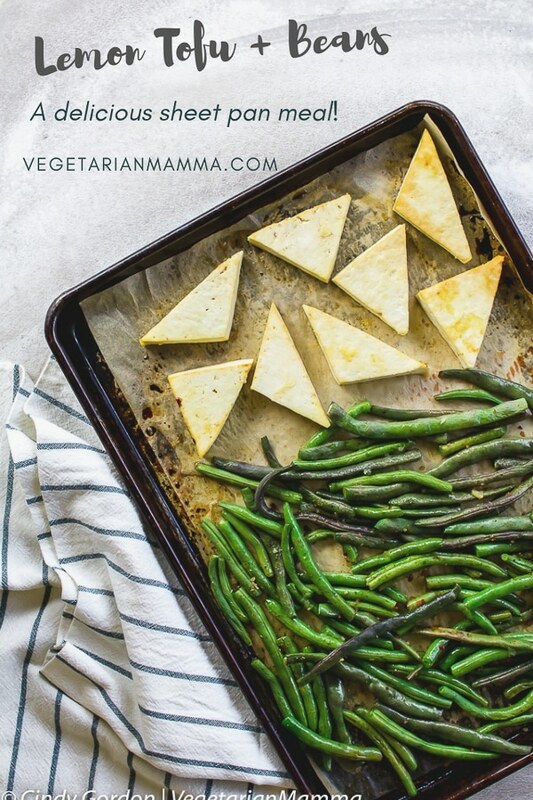 This baked tofu recipe is a prime example of all the different ways you can cook tofu! There isn’t just one way to eat tofu, and that’s why we love it so much in our home! Once you have pressed your tofu, it is game time. You are going to make your lemon sauce and trim the ends of your green beans. First up, is the tofu. You are going to cut it into triangles after you press it. 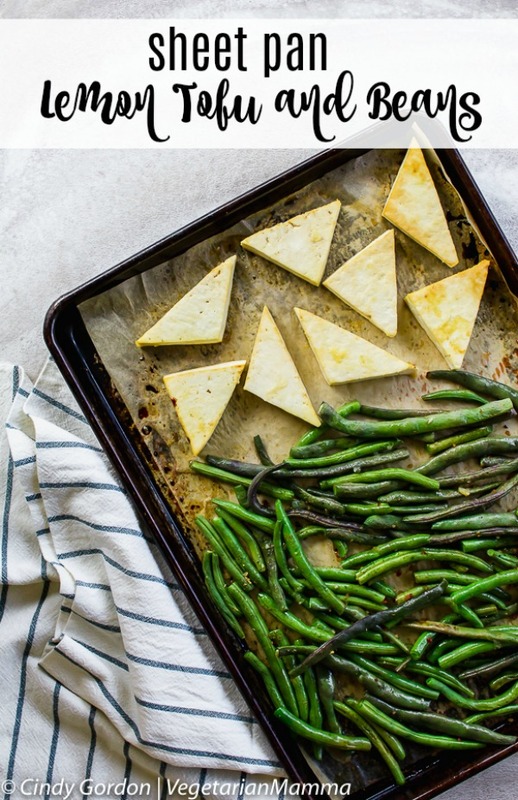 Cut the tofu into three-sided triangles and place in a single layer on the baking sheet. Then you are going to bake the tofu, then flip the tofu and add the beans only to bake some more. I love the color of the beans before you bake them. Did you know that when you bake purple beans they lose most of their color? It’s a very good tip to know otherwise you may have quite a shock when you open your oven and notice your beans look really different! What can I use to keep the food from sticking to the baking pan? Is all soy sauce naturally gluten-free? 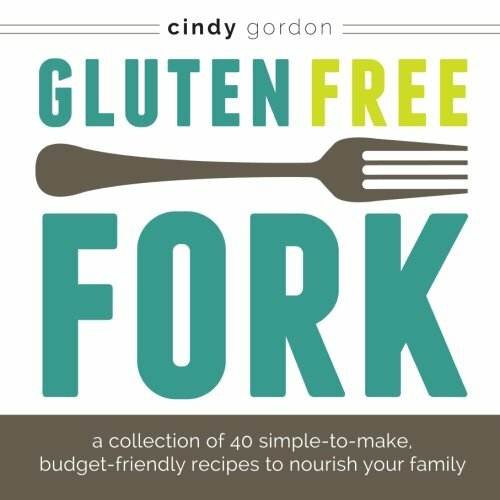 No, You can find gluten-free soy sauce, or use Bragg’s Amino or Coconut Aminos. In this recipe, we used coconut aminos but you can sub out with any of these. With any recipe, you can substitute for frozen items, but just be prepared that it may not turn out like the recipe states. Frozen items will have extra moisture trapped in them which can then release out into your food giving it a soggier appearance or taste. 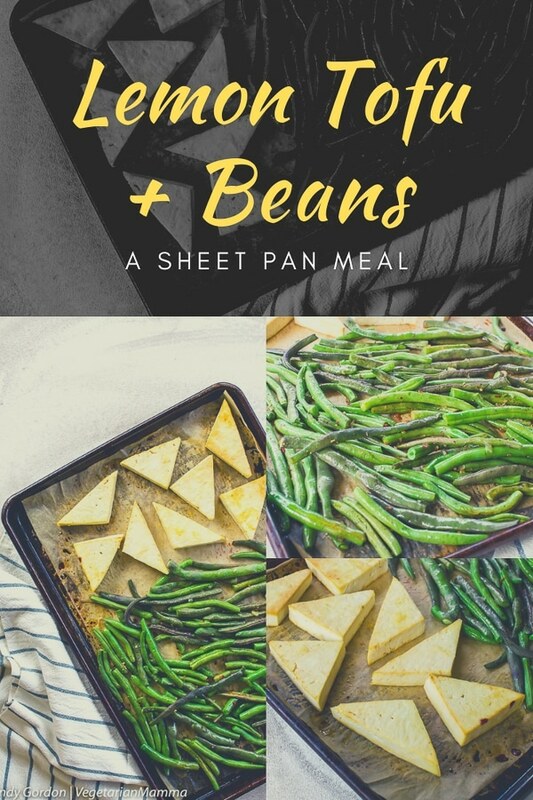 What type of beans do you use in this recipe? 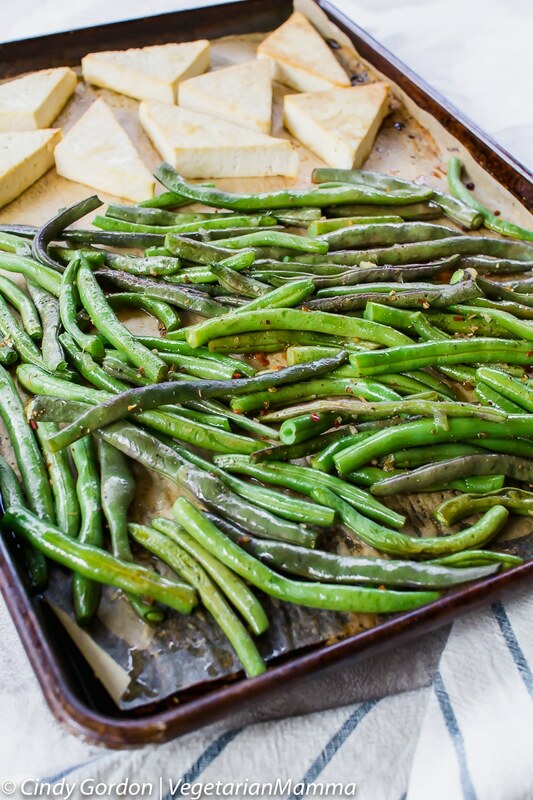 We use fresh green beans but you could always experiment and try to use black beans or another type of bean variation. The more beans, the more protein, right? 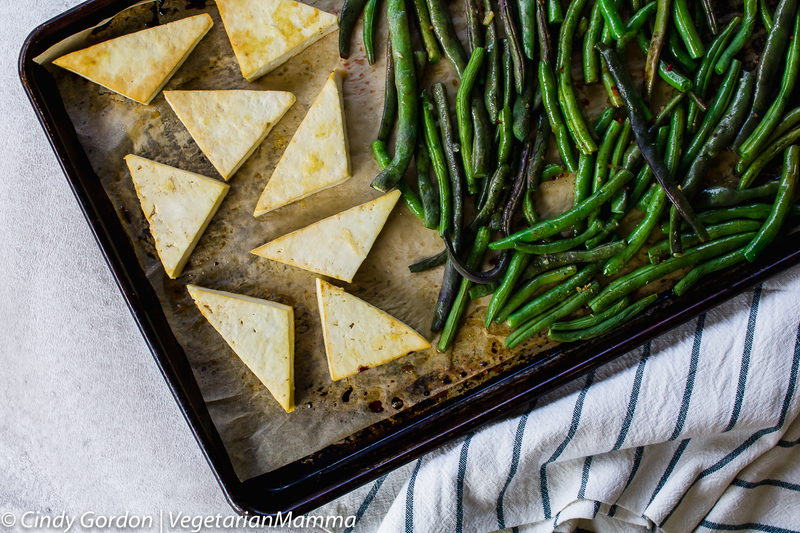 What type of seasonings do you add to this baked lemon tofu recipe? I always like to add seasonings in by ½ teaspoons, that way I can taste a difference slowly and know whether to stop adding or not. When it comes to a sheet pan meal like this, you can even add in a little bit of crushed red pepper at the end to give it a kick of spice! Do you have a favorite way to cook and eat your tofu? I’d love to hear all about it! Lemon Tofu and Bean is a one-pan meal that the entire family will enjoy. The tofu is baked to the perfect tenderness and lightly seasoned with fresh lemon juice. Using a press, press the tofu for 15 minutes. Gradually dialing the knobs tighter every few minutes. 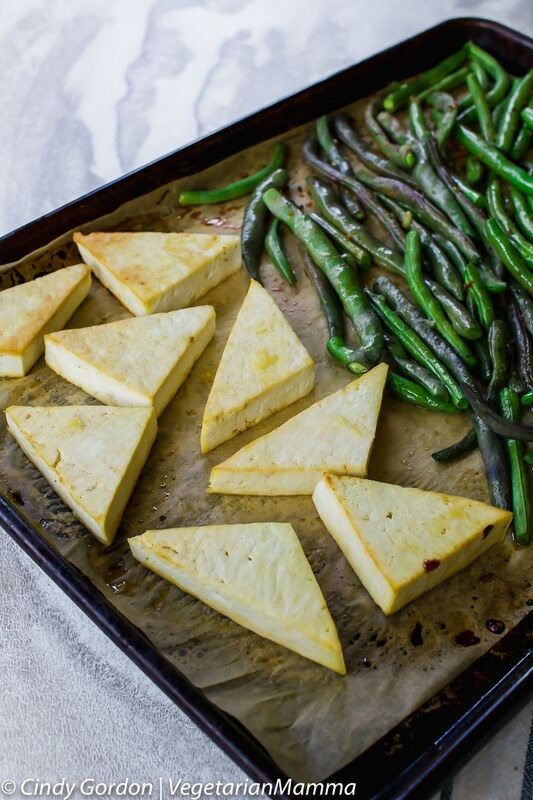 Drain liquid, cut tofu into triangles. Set aside. Mix sauce ingredients. Use 3/4 of the sauce. Pour that sauce over tofu and let stand for 30 minutes. While tofu is soaking up the flavors from the lemon sauce, wash the beans and cut off the ends. Lay parchment paper on a lipped baking sheet. Place tofu slices on the sheet. Bake at 400 degrees F for 12 minutes. 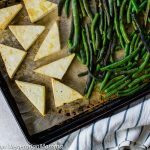 Flip tofu and add beans to baking sheet. Drizzle the remaining 1/4 of the sauce on the beans. Season with salt and pepper. Bake for another 12 minutes or until beans are cooked. I love this sort of a healthy easy dinner. I’m a tofu fan and cook with it often and you just introduced me to something I never knew I needed/wanted. The EZ Tofu Press is such a cool tool! I’m all over it. This looks so delicious! The EZ-Press is a fantastic tool! I’ve always wrapped my tofu and pressed it, but this would be so much easier! I’ve never seen a tofu press before. It’s genius!